The quarterback denies the allegations. 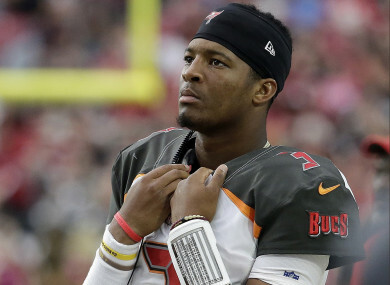 THE NFL HAS launched an investigation into a woman’s allegation that Jameis Winston groped an Uber driver in 2016, according to Talal Ansari of BuzzFeed. The allegation came from an Uber driver who picked up Winston in downtown Scottsdale, Arizona, at approximately 2am March 2016, BuzzFeed reported. According to the driver, Winston was in the passenger seat and “grabbed [her] crotch” when they stopped at a restaurant drive-thru to pick up some food. “The men placed Winston in the front passenger seat; Kate said he was the only passenger. ‘I started driving, and right away, Jameis behaved poorly’ by shouting, in part, homophobic slurs at pedestrians, said Kate, who did not want to be identified for fear of negative attention and potential backlash from football fans. He then asked to stop for food. BuzzFeed viewed a letter sent from the NFL to the driver, saying they had opened an investigation into Winston. Winston released a statement on Friday denying the allegation. The Florida State University product seemingly went on to suggest that he was in the car, but was not seated next to the driver. Email “The NFL is investigating Tampa QB Jameis Winston over allegation he groped Uber driver”. Feedback on “The NFL is investigating Tampa QB Jameis Winston over allegation he groped Uber driver”.